NEW ORLEANS (Gazette) — Jessica Simpson tweeted about how her mini-dress was so wrinkled when she went out recently. However, she also bragged about how fine her legs looked. In her Instagram photo she said how proud she is to walk around with her lovely legs. She said that her workouts have done a fine job shaping up her gams. 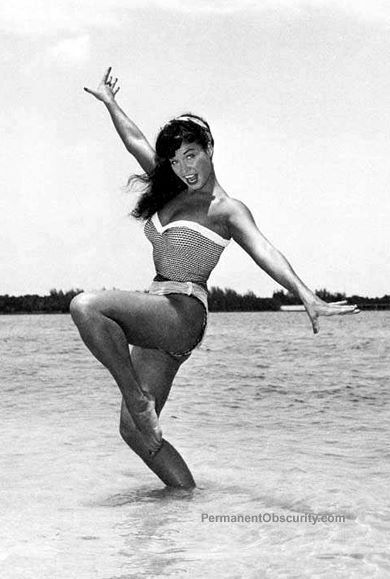 Also, seeing Bettie Page on the beach in this picture sure makes me ready to spend some time on the beach. Yesterday, I read a little bit about how Bettie Page had a tough childhood and upbringing. Her story actually reminded me a lot about the history of Marilyn Monroe. Both of their stories had a tragic, dramatic side to them. However, Bettie lived to a ripe old age surviving for 85 years even though she suffered through times in mental institutions and struggling with depression as she aged. This entry was posted in Entertainment, Science and tagged Bettie Page, depression, FaceBook, fine legs, gams, Jessica Simpson, maid, mental institution, mini-skirt, tweets, Twitter, workouts, wrinkled, wrinkled mini-skirt. Bookmark the permalink.